One of the most popular, and easiest, ways to express yourself is through your clothing. And, what says expression better than a custom designed T-Shirt. A popular fad during the 1980s, heat-pressed t-shirts bearing glittered images of television personalities and rock stars may not be the “in” thing today – but the popularity of personalized t-shirts has not really declined. Today, it’s more common to see screen-printed t-shirts bearing a popular cartoon character with some catchy phrase reflecting the personality of the wearer. Take a look in the halls of nearly any high school, and you will be bombarded with personality shirts. This is a great trend for the younger crowd, but what about young professionals? It is becoming more common than ever to see company representatives in t-shirts and golf shirts bearing the embroidered logo of their employer. Often, these shirts are presented to the company for use on casual dress days or company events. Promotional companies have built tremendous corporate customer bases through the popularity of these embroidered shirts. Similar to the process used in the glitter shirts of the 80s is the process of dye sublimation, which allows for heat transfer of a detailed and multicolored image with more accuracy and less change of fading than a standard ironed-on design. The process of dye-sublimation requires specific materials and equipment, and it is most commonly done by professionals. However with the right tools and techniques, any of the four methods of designing custom t-shirts can be done by just about anyone with a little time and creativity. Heat transfer, or iron-on, t-shirt design is perhaps the easiest and least expensive method for creating custom t-shirts for yourself, your friends or your family. Commercial heat-press t-shirt designers generally use an industrial bed-style heat press in order to apply the customer’s choice of design to a t-shirt. The designs are printed onto a special paper, which allows the image to separate from the backing paper when the design is pressed at a high temperature. In contrast to the high costs of industrial heat presses, the home iron actually works just as well for most people interested in the world of t-shirt design. And, just about anyone with a little creativity can create their own transfer designs with a home computer and a color printer. The average cost for a professional heat press is around $500. There are a wide variety of options for those interested in purchasing this equipment, including different size machines, different temperature settings and different styles and colors. Most people could easily find an industrial heat press that meets their needs for well under $1,000. While this might sound like a pricey endeavor, it is beneficial to think of the return on investment. Generally, a custom printed t-shirt at the local mall will cost between $15 and $30. The price is 10% higher, on average, when the t-shirt is printed at or near a tourist attraction. Considering the popularity of custom t-shirts, an entrepreneur could easily recover the cost of the press in as little as one month. For heat pressing, the press is the most crucial and most expensive piece of equipment. However, many t-shirt shops are now purchasing computer systems and printers which allow for complete customization and eliminate the need to purchase and store large numbers of stock designs. With the aid of computer software and image packages, a t-shirt designer can allow customers to browse thousands of customizable images which can be quickly printed and pressed onto the t-shirt of their choosing. The cost of the computer, printer and software necessary to offer such a wide selection to customers depends more on the desired technology and individual preferences of the purchaser. A decent computer system, complete with a color printer, can cost as little as $600 and as much as several thousand dollars. Many software packages are available, and the software ranges in price from inexpensive, with less customization options, to also in the several thousand dollar range. 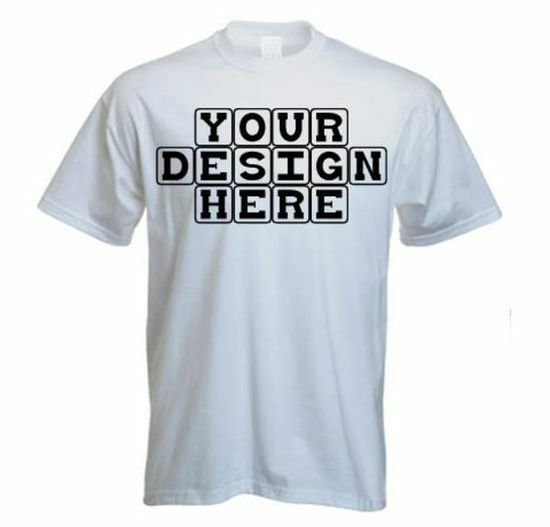 Generally, the more expensive software offers the most customization options for the t-shirt designs provided. The cost can seem daunting, however in order to consider the benefits it is necessary to explore the alternatives. Take a look at the offerings of any t-shirt kiosk in your local mall. You will see that there are usually a few hundred pre-printed designs for customers to choose from. These designs are not customizable in most cases, and they are definitely not very unique. What you may not realize is that the shop owner pays around $1 per copy of each image offered. A new t-shirt shop owner hoping to compete in the custom shirt market will need to purchase a large variety of designs in varying quantities. If you were to purchase 10 copies of 100 designs, you are already spending $1,000 for a minimal supply of designs. And, chances are that you might choose to expand your offerings. This would leave you with the already purchased designs, in addition to requiring the purchase of new and exciting designs when they become available. Because trends and fads come and go, the amount of research and background work necessary could easily be eliminated with the use of software offering quarterly design updates. Honestly, the selection of equipment depends on the desire of the t-shirt printer. If you intend to generate repeat business, you will need to stay current with your offerings – and this is true with both stock options and customizable options. One of the most popular corporate promotions and advertising methods today is the embroidered t-shirt, bearing a high contrast logo on a t-shirt. Most companies distribute these shirts to employees for casual days and corporate picnics and other events. Although t-shirts are not generally thought of as corporate attire, no one wants to visit an amusement park wearing a suit and tie. The corporate logo t-shirt generally requires little customization, because the company provides the logo to the producing company. But, unlike handcraft embroidery the threadwork needs to be done using an embroidery machine. Home embroiderers who want to create custom shirts for friends and family members will sometimes choose hand-embroidery as the production method. However, duplication is nearly impossible and can be extremely time consuming. For this reason, home embroidery machines are gaining popularity at fabric shops everywhere. Generally, a home embroidery machine with a variety of template designs costs around $500. The options for these machines are limited, and unless they come with software and connections for a home computer, the number of designs that can be produced is quite limited. Of course, there are always more templates available for purchase. Considering that the price of new templates adds up over time, it might be better for the home embroiderer to spend around $1,000 for a machine that will work with a computer, similar to the way a printer works. With this type of machine, the embroiderer can connect their machine to their computer, select a standard design, or design a custom image to be embroidered onto their t-shirt. Professional promotional companies that provide mass quantities of embroidered shirts will generally need to spend around $5,000 for the equipment necessary to mass produce embroidered t-shirts at a relatively fast rate. Of course, these machines also generally require computer systems and software. The additional cost can be as low as $600 and as much as several thousand dollars. Most would agree that the price is right, considering the average cost of $20 for a custom embroidered shirt. Embroidery has always been a popular adornment for clothing. Looking back to ancient Rome, it is evident that the more detailed a robe or tunic, the more important the wearer was to the society. Intricate designs were embroidered by hand onto silk robes and other pieces of clothing in order to customize them for the wearer. While embroidery no longer represents social status, the appreciation for fine embroidered designs is just as common today as it was then. Machine embroidery has also developed over time. Embroidery machines gained popularity during the 1990s, with a few machines to choose from. Companies familiar to tailors, including Brother and Toyota, offered the first commercial and home embroidery machines. Technology is constantly evolving, and today’s machines are much more sophisticated than those produced just a decade ago. While the original designs required machine specific templates, the advent of developing computer software now allows the t-shirt designer to design their own images, and to convert it to a standard format for use by the embroidery machine of their choosing. Standardization has also opened up the availability of millions of designs for embroiderers. The field of t-shirt embroidery is gaining in popularity among designers and shirt wearers alike. And, technological developments continue to become available to embroiderers. This reduces the amount of time and the cost of production for each individual shirt. The selection of the right equipment and software to meet your needs is an individual decision, and therefore it is important to explore the various options to find the best solution for your situation. The first screen printers lived in Japan, thousands of years ago. Evidence exists today in museums across the world, in the fine art galleries. Most of the rare Japanese prints hanging in these galleries are early forms of screen printing. Today, we see screen printed items nearly everywhere we look. Walking down a city street, you will see screen printed signs, bumper stickers and billboards. But the most commonly screen printed item is the t-shirt. Industrial screen printing is one of the least expensive methods for mass-production of printed t-shirts. A walk through any department store will place you in a sea of shirts produced in this way. There are many methods for production, but the original method used by the Japanese still provides the basic principle used in screening. The technique of screen printing utilizes some type of frame, which will align a template and the material onto which the design will appear. The template is most commonly made of thick cellophane or another non-porous material. Once the material and the template are locked into the frame, a thin layer of paint or ink is pulled across the template using a squeegee in order to guarantee an even distribution of the design. The design options for screen printed shirts are much more limited than the designs used in embroidery and heat pressing. However, they are often more interesting to the beholder. Most of the time, these designs are printed in one color – possibly as many as a handful of colors depending on the intricacy of the design. It is easier for a commercial printer to produce multi-color designs than it is for an individual at home. The design of the template for printing utilizes the idea of negative space, a concept unfamiliar to most people without an art or design background. When creating the template, it is necessary to draw out the design which will appear on the shirt and then to use an Exacto knife to cut out the inside of the desired design. Thus, most people new to screen printing will choose to begin practicing with very basic designs. Once the process of creating negative space becomes comfortable, designers can easily move to slightly more difficult patterns and images. Professional artists who generate screen printing templates will often create multiple templates for the same design, one for each color to be printed in a particular order. The ordering of the templates is crucial for multi-colored designs in order to produce the desired design as it was intended by the designer. Most professionals who opt to screen print t-shirts will purchase equipment that can automatically cut out the desired design from the template material. This process is very expensive, and so generally the produced templates will be utilized many times. This type of equipment is fairly expensive, and in order to generate a profit the designer will need to produce and sell many duplicate designs. The home screen printer, who wants to create custom screen printed designs, will not need to purchase this expensive machinery so long as they have an eye for design and a steady hand. Screen printed t-shirts are commonly worn by little league baseball teams, and school students who receive shirts for participating in events and activities. Generally, the more shirts that are produced with a similar image, the cheaper the shirts will become. For this reason, screen printing is often the method of choice when the t-shirts need to be identical. Screen printed t-shirts make great gifts for friends and family members however remember that you will need to select a sturdy material for your shirt design templates so that they will last through multiple printings. Practice makes perfect with this technique, so be sure to try printing your design on paper prior to locking that shirt into the frame. Dye sublimation is a heat transfer process used for creating custom t-shirts, and although the process is more involved and requires specialty inks the process is quite popular. Like iron-on heat transfer designs, designs printed with sublimation inks are transferred to t-shirts with the use of an iron or a heat press. The difference between dye sublimation and iron-on transfers is that with dye sublimation, the fabric of the shirt is actually changed when it absorbs the sublimation ink. This is in contract to the iron-on, which simply attaches to the shirt with a binding agent. For this reason, shirts designed with dye sublimation tend to maintain their design through many more washings. The process of dye sublimation includes printing a design onto heat transfer paper with special inks that evaporate to a gas-state when heat is applied. The ink then attaches to the fiber of the fabric onto which it is being applied. There is no change in the texture of the fabric, and the design is permanent. One of the benefits of using this type of transfer process is that the design can be much more intricate than that of an embroidered t-shirt, a screen printed t-shirt or an iron on transfer. Generally, the process involved will include a computer generated or scanned image that is printed with an ink jet printer on to sublimation transfer paper. For the home crafter, the process is a bit involved because special ink is required. While some printer manufacturers make available sublimation ink cartridges, others do not. For those that don’t have the option to use pre-filled cartridges, there are kits available for filling empty cartridges with a syringe. The process is not extremely involved and is simple once you know the steps for filling the cartridges. Once the design is printed onto the paper, it can be transferred with a hot iron or a flat heat press. Generally, steam is not preferable and therefore it is best to turn off the steam setting on the iron prior to pressing the t-shirt. The catch is that when you are selecting the t-shirt, you cannot just select any material. Artificial fabrics, like polyester, work much better with this process than natural fibers like cotton. This is because of the structure of the fibers, and their level of ink absorbency. There are ways to coat a natural fabric with polyester in order to produce the desired transfer effect on the t-shirt, however it is probably easier to just purchase a polyester t-shirt from the beginning. The process used in dye sublimation is much newer than other t-shirt transfer processes. It was actually discovered by a French printer in the 1950s. A printer realized that certain inks would vaporize and then solidify onto another fabric (or paper) when high heat was applied. The process is quite common today in the printing industry. However, because of the longevity of sublimation clothing manufacturers have also adopted the process. Interestingly enough, the process of dye sublimation can also be used when screen printing a design. The difference between this type of screen printing and normal screen printing is that instead of applying ink and pulling it across the template with a squeegee, a layer of thin, transparent film is applied atop the template and then high heat is applied to transfer the design to the t-shirt. Generally, the process of sublimation is difficult to master for the home crafter. However, once you practice and develop a technique it is very useful in t-shirt design. Industrial t-shirt manufacturers commonly use this technique to create beautiful and unique t-shirts which outlast those created using other methods.